Received July 9, 2018; Accepted December 12, 2018.; Published online January 24, 2019.
microRNAs regulate a diverse spectrum of cancer biology, including tumorigenesis, metastasis, stemness, and drug resistance. To investigate miRNA-mediated regulation of drug resistance, we characterized the resistant cell lines to 5-fluorouracil by inducing stable expression of miRNAs using lenti-miRNA library. Here, we demonstrate miR-551a as a novel factor regulating cell survival after 5-FU treatment. miR-551a-expressing cells (Hep3B-lenti-miR-551a) were resistant to 5-FU-induced cell death, and after 5-FU treatment, and showed significant increases in cell viability, cell survival, and sphere formation. It was further shown that myocyte-specific factor 2C is the direct target of miR-551a. Our results suggest that miR-551a plays a novel function in regulating 5-FU-induced cell death, and targeting miR-551a might be helpful to sensitize cells to anti-cancer drugs. Acquisition of resistance to anti-cancer drugs is one of the major obstacles leading to the failure of cancer treatment (Gottesman, 2002; Hasan et al., 2018). Cancer recurrence and the growth of resistant tumors reduce the survival rate of cancer patients; therefore, it is important to understand the underlying molecular mechanisms of drug resistance. It has been known that resistance to anti-cancer drugs can be acquired by several mechanisms, such as enhanced DNA damage repair, cell death inhibition, drug inactivation, altered cell proliferation, and activation of cancer stem cells (CSCs) (Cree and Charlton, 2017; Housman et al., 2014; Prieto-Vila et al., 2017). Although several efforts have made to overcome the multi-drug resistance of cancer cells, how drug resistance arises and how cancer cells acquire drug resistance have yet been fully elucidated. microRNAs (miRNAs) are small non-coding RNAs and function as a pivotal regulator in gene expression by inhibiting translation or facilitating the degradation of target mRNAs (Ambros, 2004; Bartel, 2004). miRNAs have been known to be involved in diverse regulation of cellular processes, such as cell growth, death, differentiation, and self-renewal; therefore, differential expression of certain miRNAs is linked to the pathogenesis of diseases (He and Hannon, 2004; McDermott et al., 2011). Accumulating evidence demonstrates that miRNAs execute active roles in regulating the drug resistance of cancer cells by affecting stress response, cell survival, autophagy, and the absortion or digestion of anti-cancer drugs (An et al., 2017; Fojo, 2007; Wang et al., 2015). In previous studies, we have established miRNA-overexpressing cell lines resistant to 5-fluorouracil (5-FU), a widely used medication to treat a range of cancers, to find miRNAs regulating the acquisition of drug resistance, and demonstrated the role of miR-200a-3p and miR-195 in 5-FU-induced cell death (Kim et al., 2018; Lee et al., 2017). In this study, we investigate the mechanism of resistance to 5-FU-induced cell death using one of the resistant clones established in our previous study (Lee et al., 2017). We identified miR-551a as a novel factor regulating cell survival after 5-FU treatment. miR-551a-expressing cells were resistant to 5-FU-induced cell death and inhibition of miR-551a sensitized cell to 5-FU. We showed that miR-551a increased cell survival after 5-FU treatment, by enhancing myocyte-specific factor 2C (MEF2C)-mediated sphere formation. Our results suggest that miR-551a plays a novel function in regulating 5-FU-induced cell death, and that targeting miR-551a might be helpful to sensitizing cells to anti-cancer drugs. Stable cell lines expressing miRNAs were established using a Lenti-miR™ Library as described in our previous studies (Kim et al., 2018; Lee et al., 2017). In brief, cells were transduced with Lenti-miR™ Library (Cat. No. PMIRHPLVAHT-1, System Biosciences, USA) (the multiplicity of infection = 10) and incubated with 10 μM of 5-FU for two weeks to establish the resistant clones. Hep3B cells were maintained with Dulbecco’s modified Eagle’s medium (Invitrogen, USA) containing 10% fetal bovine serum and 1% antibiotics. All transient transfections including miR-551a precursor, inhibitor (anti-miR-551a) (Bioneer, Korea), the plasmid encoding GFP-tagged MEF2C (pMEF2C) (Sino-Biological, China) and enhanced green fluorescent protein (EGFP) reporter plasmids were performed using Lipofectamine™ 2000 (Invitrogen, USA). EGFP reporters were constructed by inserting 3′UTR of MEF2C mRNA into pEGFP-C1 vector (BD Bioscience, Germany) or site-directed mutagenesis. Genomic DNA (gDNA) was isolated from the stable clone using AccuPrep® Genomic DNA Extraction Kit (Bioneer, Korea) according to the manufacturer’s instructions. The miRNA sequences integrated into genomic DNA were amplified by polymerase chain reaction (PCR) with specific primers and the nucleotide sequence was determined by sequencing as described in Ref. (Kim et al., 2018; Lee et al., 2017). A colorimetric assay using the tetrazolium salt, 3-(4, 5-dimethylthiazol-2-yl)-2, 5-diphenyltetrazolium bromide (MTT) was used to assess cell viability. Cells (1 × 104 cells) were plated on each well of a 96-well plate and treated with 5-FU, oxaliplatin (OXP), cisplatin (CDDP), or doxorubicin (DOX) for 72 h and then further inculated with 0.5 mg/ml of MTT for 3 h. Formazan crystals were solubilized with isopropanol and the absorbance was measured using a Victor 3 microplate reader (Perkin Elmer, Finland). Total RNAs were isolated from cell lines or sphere using TRIzol® Reagent (Life Technologies, USA). For the analysis of mRNA, complementary DNA (cDNA) was synthesized by reverse transcription using a ReverTra Ace® RT Kit (Toyobo, Japan). For miRNA analysis, cDNA was prepared using the MiR-X™ miRNA First-Strand cDNA synthesis kit (Clontech, USA) according to the manufacturer’s instructions. The relative abundance of each transcript was assessed by real-time quantitative polymerase chain reaction (RT-qPCR) using the Bioline SYBR Fast qPCR kit (Bioline, UK) and specific primer sets on the StepOne Plus™ system (Applied Biosystems, USA). Whole cell lysates were prepared using RIPA buffer containing 10 mM Tris–HCl (pH 7.4), 150 mM NaCl, 1% NP-40, 1 mM EDTA and 0.1% sodium dodecyl sulfate separated by electrophoresis in SDS-containing polyacrylamide gels (SDS-PAGE), and transferred onto poly-vinylidene difluoride (PVDF) membranes (Millipore, USA). The blots were incubated with the following antibodies against GFP, MEF2C (Santa Cruz Biotechnology, USA), and β-actin (Abcam, USA), then sequentially incubated with the appropriate secondary antibodies conjugated with horseradish peroxidase (HRP) (Santa Cruz Biotechnology, USA). Chemo-luminescent signals were visualized using NEW Clarity™ ECL substrate (Bio-Rad, USA). Cells (1 × 103 cells) were seeded in low attachment 96-well plate, and cultured in serum-free medium. After one week, spheres were observed and manually counted. The number of spheres was analyzed in triplicate for each cell type, and at least three independent experiments were carried out. To identify miRNAs involved in the acquisition of anti-cancer drug resistance to 5-FU, we established stable cell lines expressing certain miRNAs using lenti-miR library with sequential exposure to 5-FU as shown in Fig. 1A (Lee et al., 2017). The specific miRNA expressed in the GFP-positive survival clone was identified as miR-551a by genomic DNA PCR and sequencing analysis of PCR amplicon (Fig. 1B). To analyze the relative expression of miR-551a between miR-551a-expressing clone (Hep3B-lenti-miR-551a) and control cell (Hep3B-lenti-miR-Ctrl), miR-551a level was determined by miRNA RT-qPCR and the result showed higher expression of miR-551a in Hep3B-lenti-miR-551a cell (Fig. 1C). 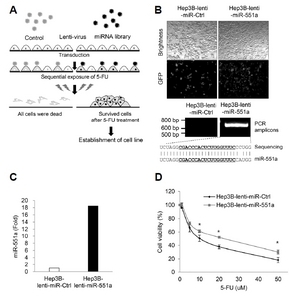 Because Hep3B-lenti-miR-551a clone survived sequential exposure to 5-FU, the relative response of Hep3B-lenti-miR-551a and Hep3B-lenti-miR-Ctrl cells to 5-FU was assessed by MTT assay. Figure 1D shows that the cell viability of Hep3B-lenti-miR-551a cell was higher than that of Hep3B-lenti-miR-Ctrl. 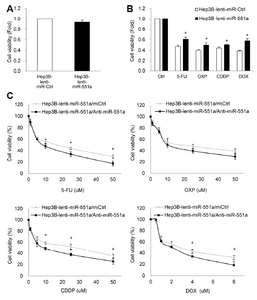 These results indicate that Hep3B-lenti-miR-551a cell was resistant after 5-FU treatment, and that miR-551a has a role in the regulation of 5-FU-induced cell death. To investigate whether miR-551a is an essential factor in regulating cell survival after anti-cancer drug treatment, cell viability between Hep3B-lenti-miR-551a and Hep3B-lenti-miR-Ctrl cells was assessed by MTT assay. No significant change of cell viability of these cell lines at basal level was observed; however, Hep3B-lenti-miR-551a cells had higher viability in response to multiple anti-cancer drugs including 5-FU, oxaliplatin (OXP), cisplatin (CDDP), and doxorubicin (DOX) compared to Hep3B-lenti-Ctrl cells (Figs. 2A and 2B). To determine whether a high level of miR-551a is responsible for an increase of cell survival in Hep3B-lenti-miR-551 cell, we investigated the effect of miR-551a inhibition using anti-miR-551a. Ectopic expression of anti-miR-551a resulted in a significant reduction of cell viability after treatment of 5-FU, CDDP, and DOX (Fig. 2C). These results indicate that miR-551a has a role in promoting cell survival in response to anticancer drugs. We observed that Hep3B-lenti-miR-551a cells are resistant to 5-FU-induced cell death, thereby increasing cell survival after 5-FU treatment. Several studies have shown that sphere formation is one of the essential characteristics affecting the drug resistance of cancer cells (Cao et al., 2011; Chen et al., 2012; Cioce et al., 2010; Fujii et al., 2009). Therefore, we investigated the sphere-forming ability of Hep3B-lenti-miR-551a cells. Figure 3A shows that Hep3B-lenti-miR-551a cells displayed enhanced sphere-forming ability, compared to Hep3B-lenti-miR-Ctrl cells. In addition, the relative expression of common stemness regulators, including OCT4, NANOG, KLF4, and SOX2, was slightly upregulated in Hep3B-lenti-miR-551a cells. To further investigate whether miR-551a has the potential to regulate sphere-forming ability, the number of spheres was analyzed after ectopic expression of miR-551a in Hep3B cells. Ectopic expression of miR-551a increased the number of spheres and the levels of common stemness regulators in Hep3B cells (Fig. 3B). In addition, sphere-forming ability between Hep3B-lenti-miR-551a cells and Hep3B-lenti-miR-Ctrl cells after 5-FU treatement was further analyzed. While Hep3B-lenti-miR-Ctrl cells failed to form spheres after 5-FU treatment, Hep3B-lenti-miR-551a cells survived, and generated spheres, even in the presence of 5-FU (Fig. 3C). 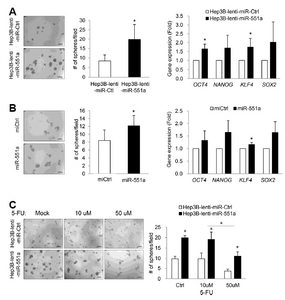 Taken together, these results indicate that miR-551a promotes the sphere formation of Hep3B cells, thereby increasing resistance to 5-FU-induced cell death. To determine a potential target of miR-551a, in silico analysis using Targetscan and miRDB was done and identified MEF2C mRNA. Figure 4A shows that MEF2C mRNA has the binding site for miR-551a at its 3′UTR (2145–2151 nt). 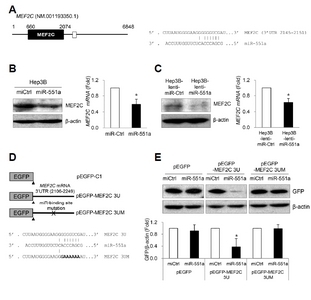 Ectopic expression of miR-551a decreased MEF2C expression at both mRNA and protein level in Hep3B cells (Fig. 4B). In addition, a lower expression of MEF2C was observed in Hep3B-lenti-miR-551a compared to Hep3B-lenti-miR-Ctrl cell (Fig. 4C). These results indicate that MEF2C expression is regulated by miR-551a. To further determine whether MEF2C is the direct target of miR-551a, we generated EGFP reporter contructs containing 3′UTR of MEF2C mRNA (2015–2246 nt)(pEGFP-MEF2C 3U) or mutant 3′UTR missing the seed region binding site for miR-551a (pEGFP-MEF2C 3UM) and relative EGFP expression was assessed by Western blotting (Fig. 4D). Overexpression of miR-551a reduced EGFP-MEF2C 3U reporter but did not change the level of EGFP control or EGFP-MEF2C 3UM (Fig. 4D). 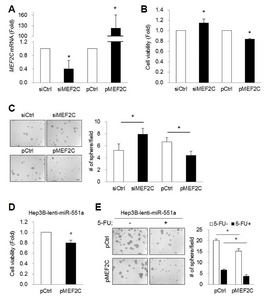 These results suggest that MEF2C is the direct target of miR-551a. We showed that miR-551a-expressing cells increased the number of spheres, and that MEF2C is the direct target of miR-551a (Fig. 3 and Fig. 4). To investigate whether sphere forming ability is affected by MEF2C, Hep3B cells were transfected with MEF2C siRNA or pMEF2C plasmid (Fig. 5A), then cell viability and sphere forming ability were assessed as described previously. Knockdown of MEF2C increased, while MEF2C overexpression decreased both cell viability and the number of spheres after 5-FU treatment (Figs. 5B and 5C). To further elucidate whether the miR-551a-mediated MEF2C downregulation is responsible for the resistant phenotypes in response to 5-FU, MEF2C was ectopically expressed in Hep3B-lenti-miR-551a cells and cells were further incubated with 5-FU. As shown in Figs. 5D and 5E, MEF2C expression reduced cell viability and the number of spheres in Hep3B-lenti-miR-551a cells after 5-FU treatment. These results indicate that MEF2C overexpression sensitized Hep3B-lenti-miR-551a cells in response to 5-FU and the miR-551a-MEF2C axis has a role in 5-FU-induced cell death by regulating sphere formation. Although numerous efforts have made to understand how cancer cells acquire anti-cancer drug resistance, it still remains a major obstacle to effective cancer therapy. Drug inactivation, drug target alteration, DNA damage response, cell death inhibition, EMT development or an increase of stemness contribute to the anti-cancer drug resistance of cancer cells (Hasan et al., 2018; Housman et al., 2014). In this study, we demonstrate miR-551a as a novel factor regulating cell survival after 5-FU treatment. We identified miR-551a in one of the 5-FU resistant Hep3B clones established using lenti-miR library (Lee et al., 2017). We showed that miR-551a-expressing cells are resistant to 5-FU-induced cell death, and that inhibition of miR-551a sensitized Hep3B cells to 5-FU by regulating MEF2C-mediated sphere formation. Our results suggest that miR-551a plays a novel function in regulating 5-FU-induced cell death, and that targeting miR-551a might decrease the resistance of cancer cells to anti-cancer drugs. miRNAs execute a major part in several aspects of cancer progression including tumorigenesis, metastasis, differentiation of cancer stem cells, and drug resistance (Caliskan et al., 2017; Deng et al., 2016; Van Roosbroeck and Calin, 2017). Aberrant expressions of certain miRNAs execute tumor suppressive or oncogenic roles, and could be a useful biomarker or drugable target (Hayes et al., 2014; Jansson and Lund, 2012). In this study, we demonstrated the role of miR-551a as a novel factor regulating anti-cancer drug-induced cell death. miR-551a is known to have a tumor-suppressive function by targeting phosphatase of regenerating liver-3 (PRL-3), insulin receptor substrate 2 (IRS2), and creatin kinase brain-type (CKB) in certain types of cancer, including gastric, colon, and ovarian cancer (Du and Sha, 2017; Li et al., 2012; Loo et al., 2015). Although aberant expression of miR-551a has been reported so far, little is known about the cellular function and molecular target of miR-551a. We demonstrate that miR-551a promotes cell survival, by increasing the sphere formation of cancer cells after 5-FU treatment (Figs. 2 and 3). In this study, we did not investigate the level of miR-551a in the tissues from the patients who have drug resistance; and further studies are required to provide the clinical significance of miR-551a in the regulation of drug resistance. MEF2C is a member of the MEF2 gene family and regulates cell differentiation, self renewal, and stemness (Abad et al., 2017; Cho et al., 2011; Ignatius et al., 2017; Li et al., 2008; Rocha et al., 2016). In addition, MEF2C is also known to control cell migration and the proliferation of cancer cells (Wang et al., 2016; Zhang et al., 2018). Therefore, dysregulation of MEF2C expression affects the developmental process or cancer progression. Several miRNAs, including miR-21, -27, -135, -155,- 204, -214, and -448 have been reported to target MEF2C mRNA (Cheng et al., 2018; Chinchilla et al., 2011; Ling et al., 2017; Sahoo et al., 2016; Xu et al., 2015; Yelamanchili et al., 2010; Zhang et al., 2017); and we also showed that miR-551 is one of MEF2C-targeting miRNAs (Fig. 4). We observed that MEF2C directly regulates the sphere-forming ability of Hep3B cells (Fig. 5). The detailed mechanism of MEF2C-mediated sphere formation needs to be further elucidated. In this study, we characterized Hep3B-lenti-miR-551a cells as a 5-FU resistant clone. The miR-551a-expressing clone survived sequential exposure to 5-FU (Figs. 1 and 2). In Hep3B-lenti-miR-551a cells, sphere-forming ability and the expression of stemness marker genes, which are typical characteristics of cancer-initiating cells (Facompre et al., 2012), were increased even after 5-FU treatment (Fig. 3). These results suggest that miR-551a is the mediator of acquisition of drug resistance, by enhancing the sphere-formation ability of cells. Sphere formation is one of the stem-like properties of cancer-initiating cells, and is known to be related to high levels of self-renewal, tumorigenecity, anti-cancer drug resistance, and invasive phenotype of stem cells (Dieter et al., 2011; Lee et al., 2016). Several studies have demonstrated the essential roles of miRNAs in the regulation of drug resistance, by affecting the sphere-forming ability of cells (Hasegawa et al., 2014; Jeon et al., 2011; Park et al., 2014; Tung et al., 2017; Wang et al., 2017). Therefore, targeting certain miRNAs to reduce the sphere-forming ability of cancer cells could be a useful technique for effective cancer treatment. Our study provides novel insights into the function of miR-551a, which enable to the reduction of anticancer drug resistance, thereby increasing the efficiency of chemotherapy. Abad, M., Hashimoto, H., Zhou, H., Morales, M.G., Chen, B., Bassel-Duby, R., and Olson, E.N. (2017). Notch inhibition enhances cardiac reprogramming by increasing MEF2C transcriptional activity. Stem Cell Rep. 8, 548-560. Ambros, V. (2004). The functions of animal microRNAs. Nature. 431, 350-355. An, X., Sarmiento, C., Tan, T., and Zhu, H. (2017). Regulation of multidrug resistance by microRNAs in anti-cancer therapy. Acta Pharm Sin B. 7, 38-51. Bartel, D.P. (2004). MicroRNAs: genomics, biogenesis, mechanism, and function. Cell. 116, 281-297. Caliskan, M., Guler, H., and Bozok Cetintas, V. (2017). Current updates on microRNAs as regulators of chemoresistance. Biomed Pharmacother. 95, 1000-1012. Cao, L., Zhou, Y., Zhai, B., Liao, J., Xu, W., Zhang, R., Li, J., Zhang, Y., Chen, L., and Qian, H. (2011). Sphere-forming cell subpopulations with cancer stem cell properties in human hepatoma cell lines. BMC Gastroenterol. 11, 71. Chen, S.F., Chang, Y.C., Nieh, S., Liu, C.L., Yang, C.Y., and Lin, Y.S. (2012). Nonadhesive culture system as a model of rapid sphere formation with cancer stem cell properties. PLoS One. 7, e31864. Cheng, X., Du, J., Shen, L., Tan, Z., Jiang, D., Jiang, A., Li, Q., Tang, G., Jiang, Y., and Wang, J. (2018). MiR-204-5p regulates C2C12 myoblast differentiation by targeting MEF2C and ERRgamma. Biomed Pharmacother. 101, 528-535. Chinchilla, A., Lozano, E., Daimi, H., Esteban, F.J., Crist, C., Aranega, A.E., and Franco, D. (2011). MicroRNA profiling during mouse ventricular maturation: a role for miR-27 modulating Mef2c expression. Cardiovasc Res. 89, 98-108. Cho, E.G., Zaremba, J.D., McKercher, S.R., Talantova, M., Tu, S., Masliah, E., Chan, S.F., Nakanishi, N., Terskikh, A., and Lipton, S.A. (2011). MEF2C enhances dopaminergic neuron differentiation of human embryonic stem cells in a parkinsonian rat model. PLoS One. 6, e24027. Cioce, M., Gherardi, S., Viglietto, G., Strano, S., Blandino, G., Muti, P., and Ciliberto, G. (2010). Mammosphere-forming cells from breast cancer cell lines as a tool for the identification of CSC-like- and early progenitor-targeting drugs. Cell Cycle. 9, 2878-2887. Cree, I.A., and Charlton, P. (2017). Molecular chess? Hallmarks of anti-cancer drug resistance. BMC Cancer. 17, 10. Deng, Y., Zhu, G., Luo, H., and Zhao, S. (2016). MicroRNA-203 As a Stemness Inhibitor of Glioblastoma Stem Cells. Mol Cells. 39, 619-624. Dieter, S.M., Ball, C.R., Hoffmann, C.M., Nowrouzi, A., Herbst, F., Zavidij, O., Abel, U., Arens, A., Weichert, W., and Brand, K. (2011). Distinct types of tumor-initiating cells form human colon cancer tumors and metastases. Cell Stem Cell. 9, 357-365. Du, Z., and Sha, X. (2017). Demethoxycurcumin inhibited human epithelia ovarian cancer cells’ growth via up-regulating miR-551a. Tumour Biol. 39, 1010428317694302. Facompre, N., Nakagawa, H., Herlyn, M., and Basu, D. (2012). Stem-like cells and therapy resistance in squamous cell carcinomas. Adv Pharmacol. 65, 235-265. Fojo, T. (2007). Multiple paths to a drug resistance phenotype: mutations, translocations, deletions and amplification of coding genes or promoter regions, epigenetic changes and microRNAs. Drug Resist Updat. 10, 59-67. Fujii, H., Honoki, K., Tsujiuchi, T., Kido, A., Yoshitani, K., and Takakura, Y. (2009). Sphere-forming stem-like cell populations with drug resistance in human sarcoma cell lines. Int J Oncol. 34, 1381-1386. Gottesman, M.M. (2002). Mechanisms of cancer drug resistance. Annu Rev Med. 53, 615-627. Hasan, S., Taha, R., and Omri, H.E. (2018). Current opinions on chemoresistance: an overview. Bioinformation. 14, 80-85. Hasegawa, S., Eguchi, H., Nagano, H., Konno, M., Tomimaru, Y., Wada, H., Hama, N., Kawamoto, K., Kobayashi, S., and Nishida, N. (2014). MicroRNA-1246 expression associated with CCNG2-mediated chemoresistance and stemness in pancreatic cancer. Br J Cancer. 111, 1572-1580. Hayes, J., Peruzzi, P.P., and Lawler, S. (2014). MicroRNAs in cancer: biomarkers, functions and therapy. Trends Mol Med. 20, 460-469. He, L., and Hannon, G.J. (2004). MicroRNAs: small RNAs with a big role in gene regulation. Nat Rev Genet. 5, 522-531. Housman, G., Byler, S., Heerboth, S., Lapinska, K., Longacre, M., Snyder, N., and Sarkar, S. (2014). Drug resistance in cancer: an overview. Cancers (Basel). 6, 1769-1792. Ignatius, M.S., Hayes, M.N., Lobbardi, R., Chen, E.Y., McCarthy, K.M., Sreenivas, P., Motala, Z., Durbin, A.D., Molodtsov, A., and Reeder, S. (2017). The NOTCH1/SNAIL1/MEF2C Pathway Regulates Growth and Self-Renewal in Embryonal Rhabdomyosarcoma. Cell Rep. 19, 2304-2318. Jansson, M.D., and Lund, A.H. (2012). MicroRNA and cancer. Mol Oncol. 6, 590-610. Jeon, H.M., Sohn, Y.W., Oh, S.Y., Kim, S.H., Beck, S., Kim, S., and Kim, H. (2011). ID4 imparts chemoresistance and cancer stemness to glioma cells by derepressing miR-9*-mediated suppression of SOX2. Cancer Res. 71, 3410-3421. Kim, C., Hong, Y., Lee, H., Kang, H., and Lee, E.K. (2018). MicroRNA-195 desensitizes HCT116 human colon cancer cells to 5-fluorouracil. Cancer Lett. 412, 264-271. Lee, C.H., Yu, C.C., Wang, B.Y., and Chang, W.W. (2016). Tumorsphere as an effective in vitro platform for screening anticancer stem cell drugs. Oncotarget. 7, 1215-1226. Lee, H., Kim, C., Kang, H., Tak, H., Ahn, S., Yoon, S.K., Kuh, H.J., Kim, W., and Lee, E.K. (2017). microRNA-200a-3p increases 5-fluorouracil resistance by regulating dual specificity phosphatase 6 expression. Exp Mol Med. 49, e327. Li, H., Radford, J.C., Ragusa, M.J., Shea, K.L., McKercher, S.R., Zaremba, J.D., Soussou, W., Nie, Z., Kang, Y.J., and Nakanishi, N. (2008). Transcription factor MEF2C influences neural stem/progenitor cell differentiation and maturation in vivo. Proc Natl Acad Sci USA. 105, 9397-9402. Li, Z., Cao, Y., Jie, Z., Liu, Y., Li, Y., Li, J., Zhu, G., Liu, Z., Tu, Y., and Peng, G. (2012). miR-495 and miR-551a inhibit the migration and invasion of human gastric cancer cells by directly interacting with PRL-3. Cancer Lett. 323, 41-47. Ling, X., Yao, D., Kang, L., Zhou, J., Zhou, Y., Dong, H., Zhang, K., Zhang, L., and Chen, H. (2017). Involment of RAS/ERK1/2 signaling and MEF2C in miR-155-3p inhibition-triggered cardiomyocyte differentiation of embryonic stem cell. Oncotarget. 8, 84403-84416. Loo, J.M., Scherl, A., Nguyen, A., Man, F.Y., Weinberg, E., Zeng, Z., Saltz, L., Paty, P.B., and Tavazoie, S.F. (2015). Extracellular metabolic energetics can promote cancer progression. Cell. 160, 393-406. McDermott, A.M., Heneghan, H.M., Miller, N., and Kerin, M.J. (2011). The therapeutic potential of microRNAs: disease modulators and drug targets. Pharm Res. 28, 3016-3029. Park, E.Y., Chang, E., Lee, E.J., Lee, H.W., Kang, H.G., Chun, K.H., Woo, Y.M., Kong, H.K., Ko, J.Y., and Suzuki, H. (2014). Targeting of miR34a-NOTCH1 axis reduced breast cancer stemness and chemoresistance. Cancer Res. 74, 7573-7582. Prieto-Vila, M., Takahashi, R.U., Usuba, W., Kohama, I., and Ochiya, T. (2017). Drug resistance driven by cancer stem cells and their niche. Int J Mol Sci. 18, 2574. Rocha, H., Sampaio, M., Rocha, R., Fernandes, S., and Leao, M. (2016). MEF2C haploinsufficiency syndrome: Report of a new MEF2C mutation and review. Eur J Med Genet. 59, 478-482. Sahoo, S., Meijles, D.N., Al Ghouleh, I., Tandon, M., Cifuentes-Pagano, E., Sembrat, J., Rojas, M., Goncharova, E., and Pagano, P.J. (2016). MEF2C-MYOCD and leiomodin1 suppression by miRNA-214 promotes smooth muscle cell phenotype switching in pulmonary arterial hypertension. PLoS One. 11, e0153780. Tung, S.L., Huang, W.C., Hsu, F.C., Yang, Z.P., Jang, T.H., Chang, J.W., Chuang, C.M., Lai, C.R., and Wang, L.H. (2017). miRNA-34c-5p inhibits amphiregulin-induced ovarian cancer stemness and drug resistance via downregulation of the AREG-EGFR-ERK pathway. Oncogenesis. 6, e326. Van Roosbroeck, K., and Calin, G.A. (2017). Cancer hallmarks and MicroRNAs: the therapeutic connection. Adv Cancer Res. 135, 119-149. Wang, J., Yang, M., Li, Y., and Han, B. (2015). The role of MicroRNAs in the chemoresistance of breast cancer. Drug Dev Res. 76, 368-374. Wang, W., Li, Y., Liu, N., Gao, Y., and Li, L. (2017). MiR-23b controls ALDH1A1 expression in cervical cancer stem cells. BMC Cancer. 17, 292. Wang, W., Org, T., Montel-Hagen, A., Pioli, P.D., Duan, D., Israely, E., Malkin, D., Su, T., Flach, J., and Kurdistani, S.K. (2016). MEF2C protects bone marrow B-lymphoid progenitors during stress haematopoiesis. Nat Commun. 7, 12376. Xu, Z., Han, Y., Liu, J., Jiang, F., Hu, H., Wang, Y., Liu, Q., Gong, Y., and Li, X. (2015). MiR-135b-5p and MiR-499a-3p promote cell proliferation and migration in atherosclerosis by directly targeting MEF2C. Sci Rep. 5, 12276. Yelamanchili, S.V., Chaudhuri, A.D., Chen, L.N., Xiong, H., and Fox, H.S. (2010). MicroRNA-21 dysregulates the expression of MEF2C in neurons in monkey and human SIV/HIV neurological disease. Cell Death Dis. 1, e77. Zhang, H., Liu, W., Wang, Z., Meng, L., Wang, Y., Yan, H., and Li, L. (2018). MEF2C promotes gefitinib resistance in hepatic cancer cells through regulating MIG6 transcription. Tumori. Zhang, R., Sui, L., Hong, X., Yang, M., and Li, W. (2017). MiR-448 promotes vascular smooth muscle cell proliferation and migration in through directly targeting MEF2C. Environ Sci Pollut Res Int. 24, 22294-22300.